People with abortion-wounded hearts who are ready to acknowledge that something is not right in their soul will easily name at least three primary emotions that haunt them: guilt, shame, and grief. I certainly would have named those three, but, to me, they felt deeper than just emotions; they became more like conditions of my heart. Guilt: A moral condition that produces guilty feelings. When we break one of God’s moral laws, we feel guilt because we are guilty. The human soul was not created to carry the weight of moral guilt. We can’t just brush it off. It requires a recompense, an atonement, or a punishment. Shame: It’s the companion of guilt and part of the consequence of moral guilt. Shame kind of feels like it sounds. It’s heavy, it’s slimy, it covers you, and it’s full of accusation. Shame begins to redefine you and tries to tell you who you are and who you are not. Shame is demanding, and, eventually, it intertwines with your personality and tries to convince you it’s just part of who you are, so just accept it and move on. Grief: Unspecific grief is like a dreary day. There’s a constant drizzle to it, but it never really ends; unlike a storm that comes in with thunder, lighting, and rain. It does what storms do and then it leaves. And once it moves on, the sky clears and the sun comes out. Grieving that is not redemptive or tied to a specific loss will not go away but will turn into a lingering depression and despair. Guilt, shame, and grief can rotate like a vicious tornadic cycle. Until this vicious triad is broken apart, it will never dissipate. For an abortion-wounded heart to be freed from this vicious triad, there first needs to be a spiritual reconciliation with God to remove the moral guilt. When this happens our hearts are cleansed, softened, and submitted to God. This is how our heart gets circumcised. And just like the Lord promised the children of Israel in Joshua 5:7–9, He said after they crossed the Jordan and were circumcised, God would roll away the reproach (or shame) of Egypt from their hearts. When you are carrying guilt and shame from an abortion, your grief can never be legitimized or validated because it is muddled in with all that guilt and shame. Therefore, you can never experience pure grief. But once your conscience has been cleared of the moral guilt and once your reproach and that stifling shame have been washed away, then you are free to acknowledge your loss. You can then recognize that your loss was not a just blob of tissue but a baby, and not just any baby, but your baby. What an amazing gift that Jesus Christ has given us through His sacrifice and suffering. He made a way to pay for our debt, change our heart, reconcile our relationships, and validate our losses. But He doesn’t just validate them— He heals them. His compassion is deep and wide and able to absorb our pain. He is the God of all comfort. He longs to comfort us in our losses. Through Him, we can experience redemptive grieving. When our abortion-wounded grieving is redemptive, then we are empowered to give back to our children—not from a place of guilt but from a place of moral clarity and selfless honor. We can now see them from the new vantage point of a restored heart. We can give them our mother’s or father’s blessing, and we can give them their names. We can bless them with the honor and dignity of a name. -Karen A. Ellison, Healing the Hurt that Won’t Heal, Freedom for the Abortion-Wounded and Help for the Church they Fear. 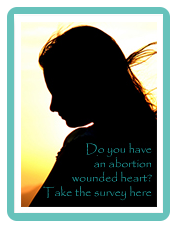 If you have had an abortion, go to www.GoDeeperStill.org to find out more about healing and retreats available.